When you ask an American student what they most miss about home, after their family, the most common response is often…the bagel. My plan L (for lottery winning) in life is to open up a bakery here in Seville called Desa y Unos that specializes in American pastries – pie of the day, quality cookies, and of course – bagels. Caroline and I still wax nostalgic over our bagel dates in college – a fresh bagel, toasted crispy and shmeared with flavored cream cheese accompanied by an almond latte. So, so, so good. Here in Spain, they are not to be found. Like anything denied, it starts to grow in importance, taking on a rosy glow in your memory. I had had it. I had made gluten free bagels before, why not make glutentastic ones? I called up my friend Erin and told her my plan and she started chipping in with her own sighs. The desire of her heart? 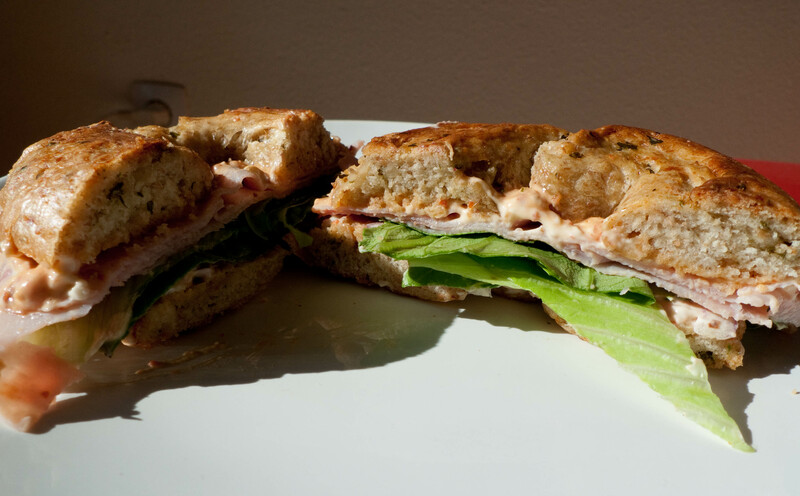 A sandwich: the Tribeca Turkey from Manhattan Bagels. The plan coalesced: we were going to make this sandwich and failure was not an option.